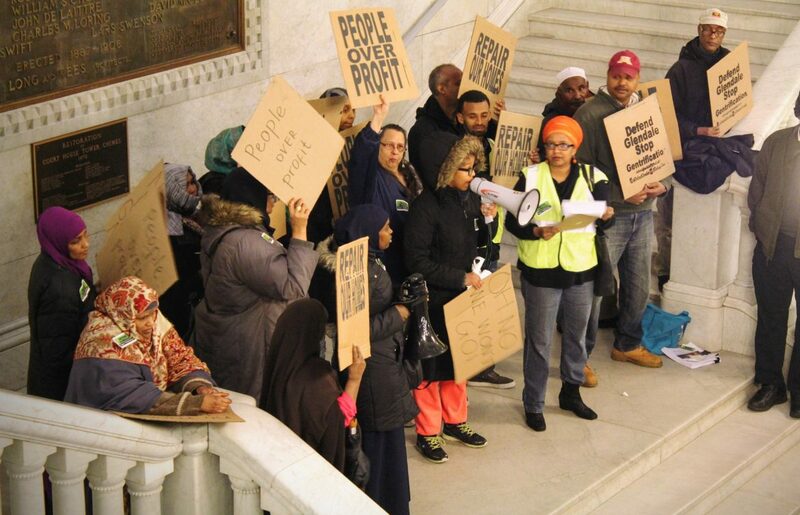 Glendale Townhomes residents protest at Minneapolis City Hall on March 30 to demand their homes be repaired, instead of redeveloped. Photo by Cristeta Boarini. Michelle Montbriand is not willing to sit back and lose her home. 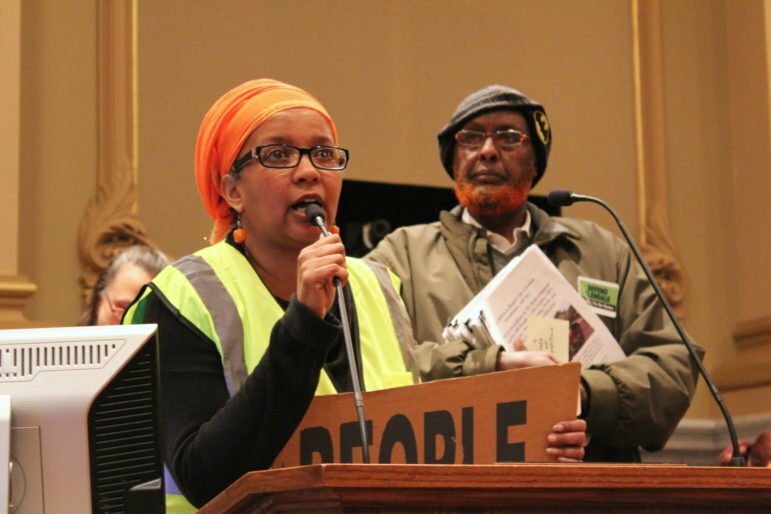 A former cook, a single mother of two, and a grandmother of four, she has turned herself into a community organizer as she and her neighbors take on the Minneapolis Public Housing Authority (MPHA) in a battle to save their community. Montbriand is one of the few white residents of the Glendale Townhomes, Minneapolis’ last remaining public housing development. She has lived in her townhome since 2003 and describes the community as unique, tight-knit, and where everybody knows each other. Ladan Yusuf also has made her home at Glendale. A community organizer originally from the East Coast, she lives with her teenage daughter, also a community organizer. As an educated, Somali, woman of color, she says it has been difficult to find her place in the Twin Cities because of the racism she has faced. As a Glendale resident, however, she has found a place as a community leader and as someone trusted and appreciated by her fellow residents. Montbriand, Yusuf, and their neighbors worry that they may be about to lose their homes as the city of Minneapolis and MPHA consider the future of the Glendale Townhomes. While they love their homes at Glendale, the residents say the 64-year-old public housing complex has fallen into disrepair. The residents want the city to simply fix their townhomes, but the city seems poised to redevelop instead of rehabilitate. Three out of the city’s four possible plans for Glendale include redevelopment of Glendale’s site–potentially displacing residents to do so. On top of it all, Minneapolis has struggled to engage the residents in the decision. Some residents, however, refuse to go down without a fight. In 2015, Montbriand, Yusuf, and others formed a group called Defend Glendale to organize for home repairs and protect against MPHA tearing down and redeveloping the townhomes. Glendale residents are proud of the sense of cohesion, the sense of family, the sense of neighborhood. With 184 homes located on nearly 15 acres in 28 buildings, Glendale is Minneapolis’ oldest public housing complex, built in 1952 and named after two Minneapolis elected officials: Glen Wallace and Dale Stanchfield. The townhomes were originally designed as homes for veterans returning from war and have also been home to thousands of immigrant, low-income, and refugee families over the last six decades. Located in Minneapolis’ Prospect Park neighborhood, Glendale is made up of primarily East African and Hmong refugee and immigrant families with just a few white families mixed in. More than 50 percent of the residents are younger than 18. Many of the families have called Glendale home for many years. The community is dotted with gardens planted by its Hmong residents. “The Hmong community share with everybody in the community. And that is fantastic. I don’t know any other housing development that does that,” Montbriand said. The Twin Cities Daily Planet acquired hundreds of emails, meeting minutes, and reports from MPHA, the Office of Community Planning and Economic Development with the City of Minneapolis, and the Prospect Park Association (PPA) after a Minnesota Data Practices Act public information request. The communications revealed the plans for Glendale have long been in flux, and resident engagement has been lacking by public officials. “We formed Defend Glendale because we didn’t have a voice. There was no place for us to fight. So we created our own place to defend ourselves from being displaced,” said Yusuf. Instead of redevelopment, Defend Glendale leaders are fighting for rehabilitation. They believe their homes need basic repairs like painting, fixing broken windows, and some yard work and do not want to be pushed out of their homes or the city of Minneapolis. According to Defend Glendale, MPHA has given residents wildly different estimates for what rehabilitation would cost. During a September 2015 meeting with Defend Glendale, MPHA said that basic rehabilitation for all 184 units would cost about $5.5 million, while a significant rehabilitation would cost about $15.5 million. These estimates conflict yet a third figure estimated by third-party consultant Sherman Associates, that put a rehabilitation project at nearly $25 million. All these estimated costs are significantly more than MPHA currently has the funds to support. Boyd said his department “identified about $15 million dollars in immediate needs, many of them infrastructure issues that are below the surface.” Boyd also noted that the total amount of repairs needed for all of MPHA’s properties in the city total $112 million. Instead, Boyd said, they received $10.1 million in funding from HUD this year for all of their needs and repairs. “We would never let Glendale go into disrepair or areas that would not pass code or whatever else. But we have to juggle as best we can to meet the needs that preserve the property for as long as we can,” Boyd said. Defend Glendale leaders are calling foul. “These homes get 98 out of 100 from inspections but they chose to neglect the basic maintenance of these homes. It’s not that they just need basic repairs. It’s that MPHA doesn’t want to put money into the repairs,” Yusuf said. According to Yusuf, they have been requesting that repairs be done for months. For example, during the winter months, Montbriand talked about a fellow resident’s broken heater. That resident, Montbriand said, was told that she should turn on her oven and leave its door open, a policy which she said is against complex rules. In November 2015, Defend Glendale and Glendale residents presented their own vision for the future of the Glendale Townhomes. The petition supporting that vision for the future of Glendale has 100 signatures. They are calling for the prioritization of rehabilitation efforts with zero displacement. They are asking for structural repairs: fixing broken windows, ridding the community of rodents and mold, and updating features in the townhomes, for example. The rehabilitation of the Glendale Townhomes are not the only demands of Defend Glendale, however. Their other demands include the resignation of MPHA Executive Director and other MPHA staff for “allowing discrimination tactics, racism and abuse towards East African residents based on their national origin and threatening to displace them,” a third party financial audit of MPHA, and federal and local investigations in MPHA. Dean Carlson has been one of the MPHA staffers leading the charge when it comes to the future of the Glendale Townhomes. Carlson has a background in property management and acquisition and has worked for MPHA since late 2013, though he also worked for MPHA from 1999 to 2004 as the Housing Development Coordinator. Within just a few months of beginning his work with MPHA, in January of 2014, Carlson began discussing the potential conversion of the Glendale Townhomes to a mixed-income community. “In fact Glendale may be ‘hotter’ than Heritage Park,” Carlson said in a Jan. 30 email. Prior to bringing on Sherman Associates, the consultant group hired in September 2015 to develop viable financial possibilities for the future of Glendale, MPHA considered pursuing a policy known as Rental Assistance Development (RAD) through July 2015. RAD was enacted by Congress in 2012 and converts public housing into the Section 8 program through vouchers or rental assistance and seeks to leverage private resources for funding and property management. But MPHA kept flip-flopping on whether to implement RAD for Glendale, and thus give the residents Section 8 vouchers to move off-site. In a February 2014 email, Carlson said the program would be an unlikely option. Then MPHA decided to pursue it, and the Federal Housing and Urban Development Department agreed to a potential transition of the Glendale Townhomes to the RAD program. Ward 2 City Council Member Cam Gordon, who represents Glendale and the surrounding neighborhoods in Ward 2, voiced concerns to Carlson over email over whether Section 8 vouchers would be effective for the Glendale residents. There is a long waitlist for Section 8, and there are a limited number of properties that accept the vouchers. “I understand concerns about Section 8, but it’s actually a more stable affordable rent… Also they will have the ability to get a voucher where they can move anywhere, more mobility for them. But I completely understand concerns,” said Carlson in reply. By May 2015, Glendale’s potential future seemed to be taking shape. CPED had released a document titled “The Glendale Housing Development Project Plan” which sought to make clear the objectives, challenges, land use needs, and “anticipated redevelopment activities” for Glendale. However, by July 2015 the Minneapolis City Council Community Development and Regulatory Services Committee killed the discussions around Glendale’s redevelopment and MPHA and CPED began their work again. Just a few weeks before the city made its decision, Gordon critiqued via email the plan to redevelop Glendale, saying the housing density was too high, and that too many specifics about resident relocation were missing. “So far, it does not seem like MPHA is able to effectively manage community expectations and address concerns,” Gordon wrote. By autumn, MPHA had hired a consultant, Sherman Associates, who was hired to draft “possibilities” for the future of the Glendale Townhomes, according to Boyd. MPHA was also urged to continue meeting with Glendale residents and PPA in order to continue discussions about the future of the Glendale Townhomes. At the same time, leaders with Defend Glendale tried to make sense of the conflicting information they received. Was the project on? Was it off? Would they be relocated? Could they eventually return? But while trying to get answers, residents were faced with endless red tape and what they felt were discriminatory tactics, like information available only online which meant older residents could not engage in discussions, and fees and fines by MPHA towards the residents of color that white residents did not have to pay. 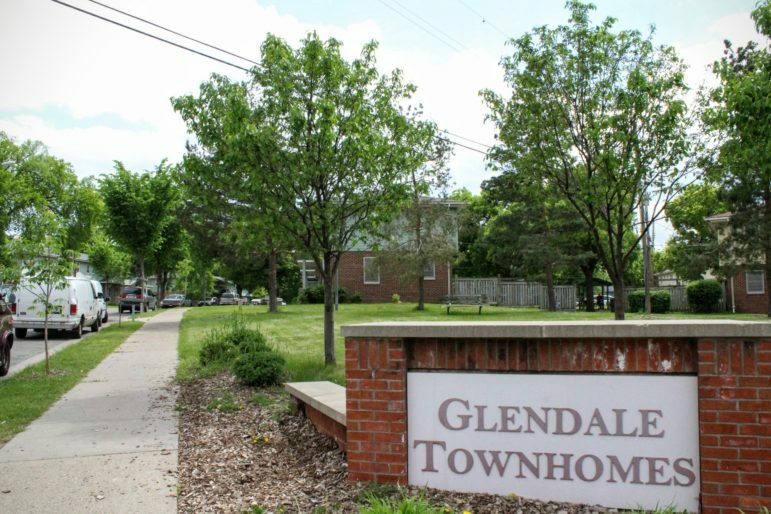 The emails acquired by the Twin Cities Daily Planet showed that discussions around the potential future of the Glendale Townhomes began in January 2014. But it was not until January of 2016 that the Glendale Townhome residents began to really understand what might be happening to their community. In September 2015, Sherman Associates was hired by MPHA to develop viable possibilities for the future of Glendale Townhomes. “In essence, we are in what is called a discovery phase. And that means we are working with a consultant [Sherman Associates] to identify financial possibilities. They are not options, they are not plans. They are just possibilities, ways we could take care of the deep financial challenges in Glendale,” said Boyd. Only one of these four possibilities speaks to rehabilitation of the existing townhomes, while the other three possibilities present some form of redevelopment. While Boyd and Carlson are quick to say that no resident will have to move, at least two plans would allow half the residents or less to move back into the townhomes. A third plan would move Glendale residents into a newly-built apartment complex. Defend Glendale has been asking for details on the source of the funding since because, according to Yusuf, they have been shared different costs and been told that MPHA has no money to rehabilitate the townhomes. However, the four options developed by Sherman Associates are not the only problems that Defend Glendale leaders have with Sherman Associates. They want to see the MPHA Board Chair resigned due to conflict of interest. MPHA Board Chair F. Clayton Tyler is married to Jackie Cherryhomes-Tyler, a political consultant and former City Council member, and a registered lobbyist for Sherman Associates as of February 2014. Defend Glendale’s work to save its community is not the only affordable housing struggle happening in the Twin Cities. As MPHA continues to work with Sherman Associates to develop what they believe are viable possibilities for the future of the Glendale Townhomes, Yusuf, Montbriand, and others plan to continuing working for what they feel is justice: the needed repairs to their homes so they can continue to live in their community.